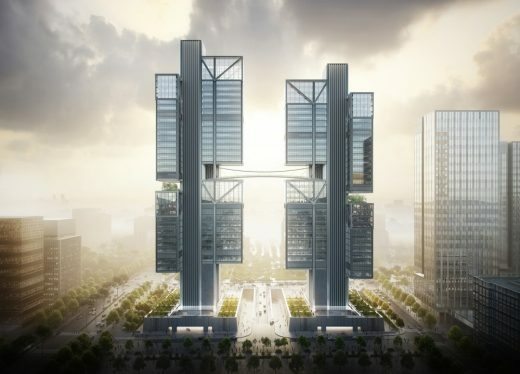 Aug. 11, 2018 – Beijing, China – MAD Architects, led by Ma Yansong, has won two international competitions to develop Shenzhen Bay Square. 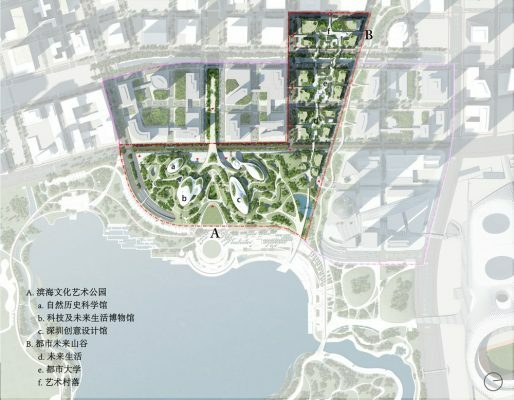 The firm’s winning masterplan (36 hectares), and architectural design (15 hectares), will see an ambitious urban development project bring a vibrant cultural complex to the area that connects Shenzhen city to the waterfront, surrounding ecological corridor, and nearby mountain ranges – creating a harmony between humans and nature. 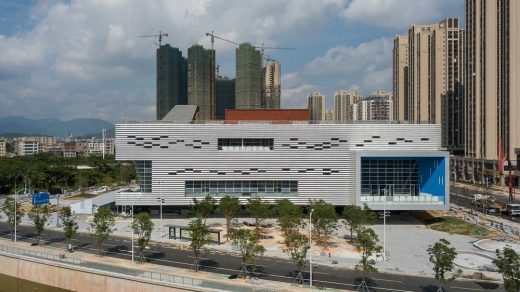 Located in the center of Qianhai district, southwest of Shenzhen, the site neighbours the Houhai area, which has developed over the last 10 years. 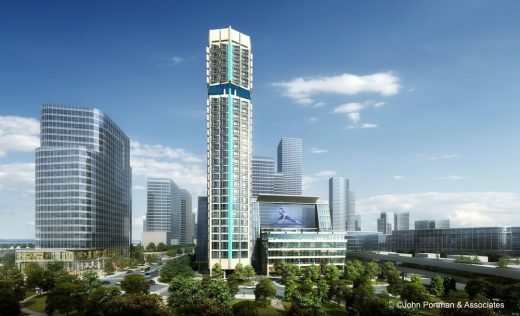 Considered to be the financial centre of the city, its numerous high-rises act as a backdrop for MAD’s scheme which proposes a staggered layout with diverse buildings. 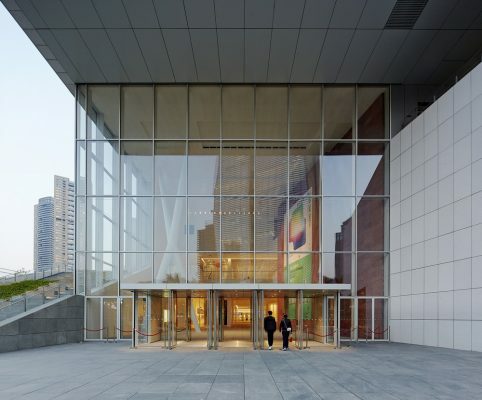 Collectively, they create a rich architectural landscape that counterbalances and complements the existing dense urban planning. 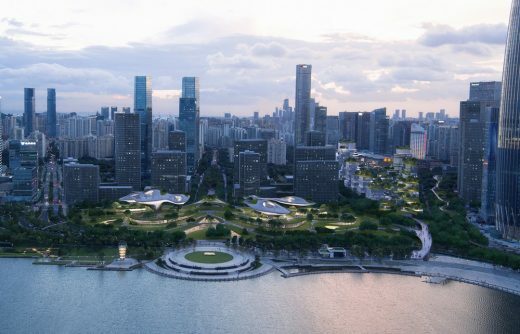 The waterfront art and culture park introduces organic shapes into the urban environment in the form of several emblematic buildings – a science museum, natural history museum, and creative design centre – along the coastline. 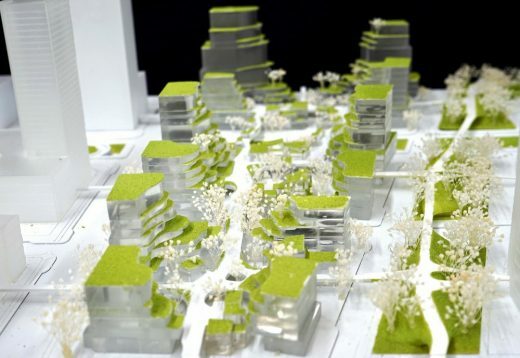 Organized as smaller-scale urban blocks, they will be punctuated by large open green spaces and natural scenery that give inhabitants and visitors alike, the experience of being in nature while they are in the city. 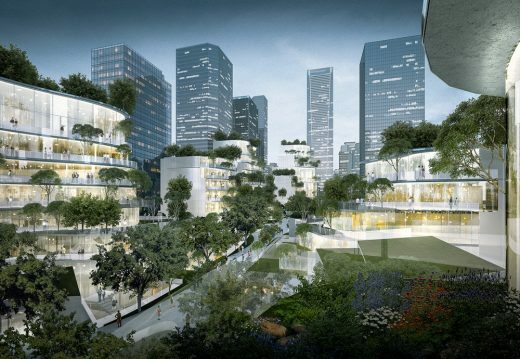 The buildings rise out of the ground, like overgrown eucalyptus trees, whose leaves stretch out horizontally to form a floating park. 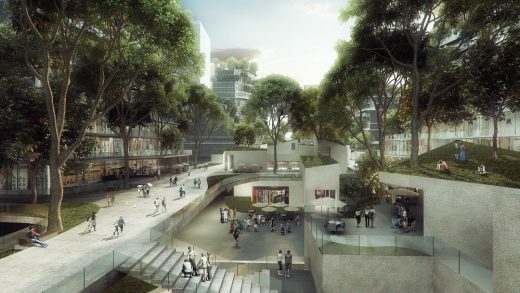 They are connected by elevated pedestrian walkways that allow people to enjoy the park scenery, the city, the sea, and natural surroundings, at different heights. 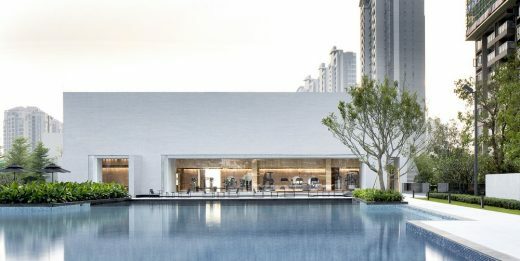 Retreating back from the coastline, their low-scale presence maintains uninterrupted panoramic views towards both Shenzhen, and the waterfront. To the northwest lies the ‘urban valley’, which will host cultural and commercial programs that serve the greater community. Retaining a human-scale approach with their modest height, the ‘low-land’ of buildings stand in contrast to the towers that envelope them. 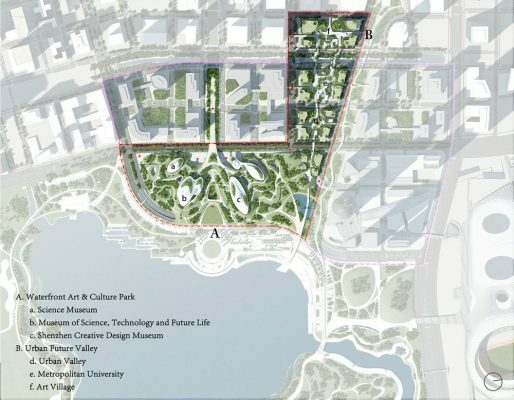 Landscape elements such as ecological green spaces, parkettes, and civic squares will be inserted throughout the plan, cultivating rich, urban pockets that reduce the feeling of any kind of barrier between the city and the waterfront. 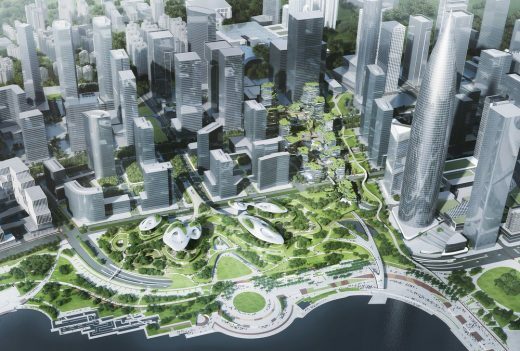 MAD’s masterplan and architectural design will transform the shoreline into an urban village that will activate the vitality of the community, and provide a richer, cultural heritage for Shenzhen. 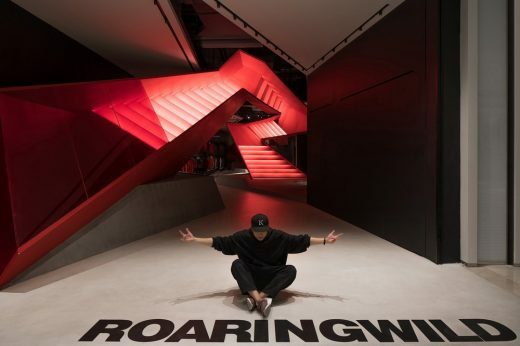 As a young, high-density metropolis that has progressed rapidly over the last 40-years Shenzhen, like many other Chinese cities, has adopted the urban development model that relies on the modernist belief of form follows function. 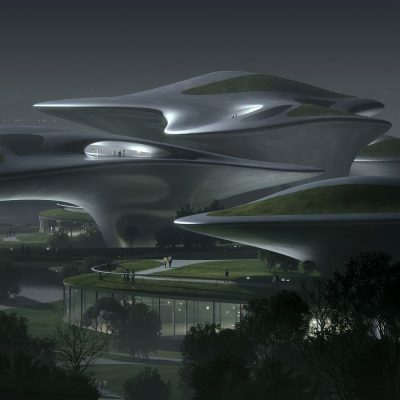 Thus, many modern Chinese cities have begun to look the same, and lack culture. 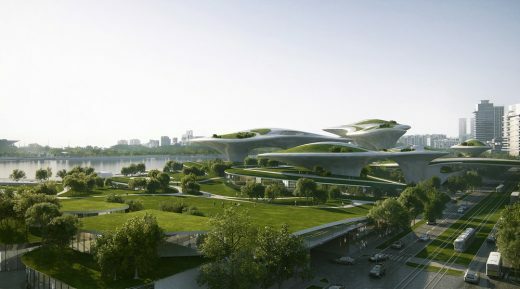 Under the premise that the extreme density of our modern cities cannot be changed, MAD takes the natural landscape as its starting point, and looks to culture, art, nature, and emotion, as guiding directions for urban development – establishing a spiritual connection between the built environment and nature. 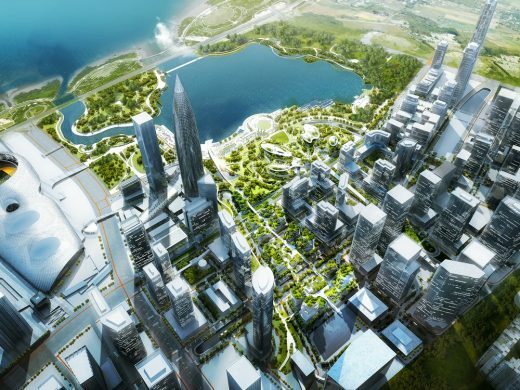 Upon completion, the “Shenzhen Bay Square” waterfront development will form a unique, world-class, cultural art harbour, placing Shenzhen on the map as a global art city.